Speak with an expert today. Schedule a free consultation. On a fixed income but dealing with nagging debt? Use these five tips to become debt free in retirement. Financial experts commonly advise soon-to-be retirees to eliminate debt prior to leaving the labor force, as it is easier to draw funds from a steady paycheck. But what if you’ve already retired and are living in the red? Retirement and good living can seem like a far-fetched dream. According to an analysis from finance website ValuePenguin, Americans age 65 and older carry an average $6,351in credit card debt. “If you are retired, it’s generally too late to plan, but it’s certainly not too late to take action,” says Hugh McDonald, a certified senior advisor and president of HJM Financial Group in Sun City, California. 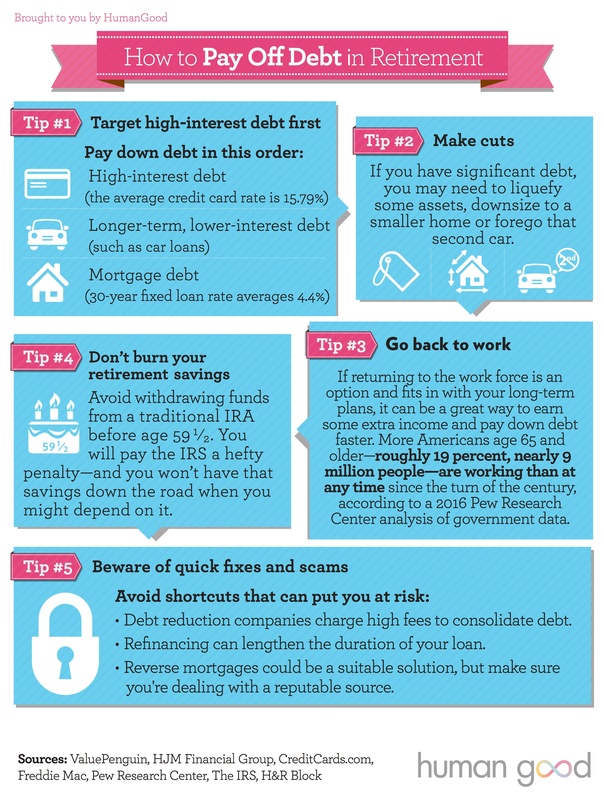 For assistance creating a plan to pay down retirement debt, print this infographic and use the tips provided in it as you work through your financial situation. Click to download or print this infographic. After years of working, saving and paying bills, it’s time to prepare your finances for the next chapter—a happy retirement. Can You Afford to Move Mom In? What is Long-Term Care Insurance, Anyway? Sign up for the latest news and updates, tips and advice. Privacy © 2019 HumanGood. All rights reserved.